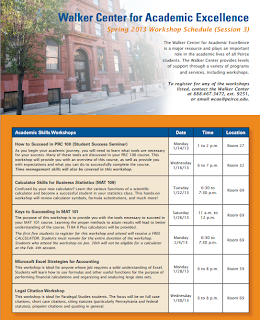 New workshops from the Walker Center have just been announced to help you strengthen your academic skills, expand your personal development, and broaden your technical knowledge in Session 3. These workshops will provide you with the resources you need to succeed in your classes, as well as add to your marketability in your professional career. 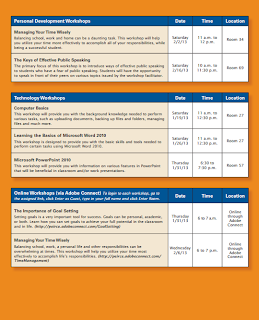 Session 3 workshops include information on academic skills, time management, professional speaking, and how to use Microsoft Word and PowerPoint. Click on the flyers below to get details on specific workshops, dates, and times. To register for any of the workshops listed, contact the Walker Center at 888.467.3472, ext. 9251, or email wcae@peirce.edu.